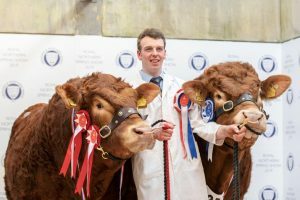 Albert Howie, West Knock, Stuartfield, Peterhead enjoyed a top day in the Limousin ring when he took the leading two prices at 8000gns and 6500gns respectively at the Spring Show Multibreed Sale held at Aberdeen & Northern Marts Thainstone Centre, Inverurie on Wednesday 27th February. 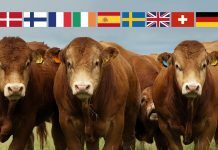 Trade was strong for the Limousin bulls on offer with the ten sold averaging £5050, up by £949 on the year. The leading price of the day was the May 2017 born Knock Nelson who made 8000gns when selling to M Mackie, Whiteside, Tullynessle, Alford. 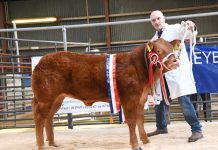 Sired by Goldies Goldfinger, Knock Nelson is out of the rising eight-year-old cow Knock Glenisla. 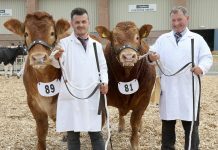 Earlier in the day Knock Nelson had also been awarded the Limousin Championship in the pre-sale show by the judge Bob Adam who runs the noted Newhouse Herd at Newhouse of Glamis, Forfar. 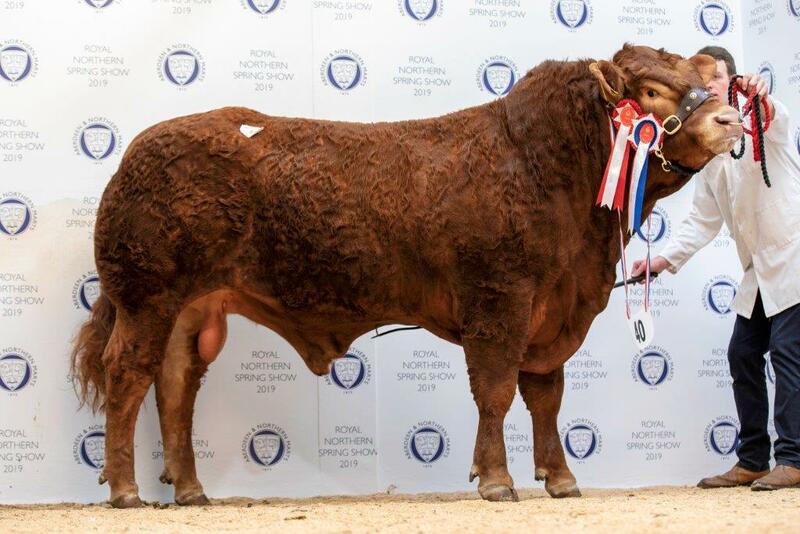 Selling at 6500gns was the Reserve Champion Knock Nickleback, another Goldies Goldfinger son. April 2017 born, Nickleback, out of the 2010 born Knock Flamboyant, was bought by A MacKay and Son, Strath Farm, Watten, Caithness. 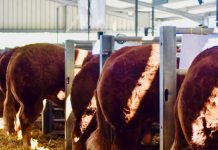 Goldies Goldfinger sons have previously sired calves in the Knock Herd which have sold up to 11,000gns and 10,000gns respectively. 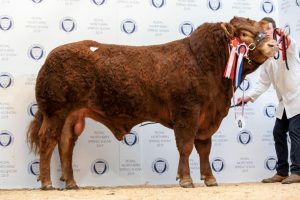 Michael Robertson, Fodderletter, Tomintoul, Ballindalloch made 5500gns when selling Fodderletter Nimrod to J&J Henderson Udale Farm, Poyntzfield, Dingwall. 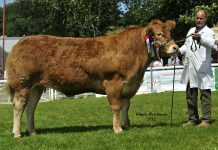 August 2017 born Nimrod had a good show record behind him with several first prizes including Limousin Champion at Dornoch Show. This bull is by Spittalton Gold and is out of the Kype Vine daughter Vaenol Gina. 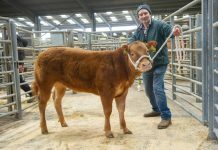 At 4800gns was Elrick Nebraska from Michael Massie, Mains of Elrick, Auchnagatt, Ellon. 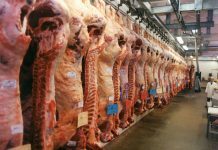 Entirley homebred this May 2017 born bull is by Elrick Jethro, a Rahoney Geoffrey son, and is out of the twelve-year-old Elrick Centrefold. 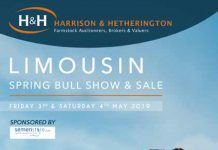 Off to Orkney this bull was bought by JS&HM Hamilton, Gorn, Harray, Orkney. Also from Michael Massie, Elrick Nemesis made 4500gns. 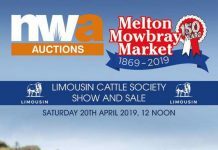 This time by Foxhillfarm Impecabull, and out of Elrick Goldengirl, the May 2017 born Nemesis was purchased by PJ&I Stuart, Ledmacoy, Strathdon.